As vertical shafts go, this is a seriously deep one! Long considered to be “bottomless” (because no-one had ever managed to find the floor), we now know it is precisely 335 meters (1099 feet) deep, making it the deepest water-filled sinkhole anywhere on the planet. The El Zacatón sinkhole is on El Rancho Azufrosa, near the town of Aldama in Tamaulipas in northeast Mexico. The sinkhole or cenote is one of several located in the same area, though recent studies have failed to demonstrate any obvious underground connections between them. The term cenote is a Spanish rendering of the Mayan word d’zonot, “a hole in the ground”. 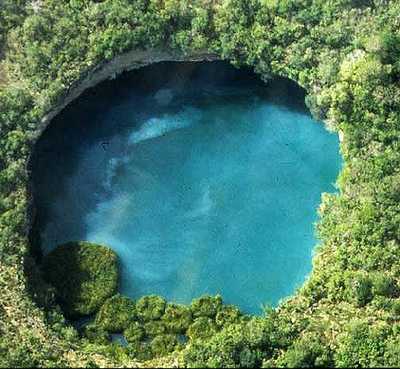 The El Zacatón pit, which is about 110 meters (360 feet) across and roughly circular, contains a deep lake. The water is warm (averaging about 30 degrees C), highly mineralized and has a sulfurous odor. The name El Zacatón comes from the floating islands of grass (zacate) which blow across this lake from one side to the other with the wind. The pit’s depth has attracted serious divers for many years. In 1993, Dr. Ann Kristovich dove to a new women’s world record depth of 169 meters (554 feet). The following year, two American explorers tried to reach the bottom of the sinkhole. Jim Bowden successfully reached a men’s world record depth of 282 meters (925 feet) but still did not touch the bottom. Tragically, his diving partner Sheck Exley died during the attempt. The mystery of the sinkhole’s depth was finally solved in 2007. A multi-million dollar exploration, mainly funded by NASA, trialled the Deep Phreatic Thermal Explorer (DEPTHX) robot, designed to explore ice-covered Europa, Jupiter’s smallest moon. Partners on the DEPTHX project include Carnegie Mellon University, Southwest Research Institute, Colorado School of Mines, The University of Arizona, and the University of Texas at Austin’s Jackson School of Geosciences. In the words of a NASA press release, The Deep Phreatic Thermal Explorer (DEPTHX) is a 3,300-pound, computerized, underwater vehicle that makes its own decisions. With more than 100 sensors, 36 onboard computers, and 16 thrusters and actuators, it decides where to swim, which samples to collect, and how to get home. Exploring El Zacatón pit was considered to be an ideal preliminary test of the DEPTHX autonomous robot, which is about the size of a go-kart. The robotic vehicle successfully generated a highly detailed sonar map of the sinkhole, and obtained samples of water and biotic material from the walls, discovering several new phyla of bacteria in the process. Its next challenge is to explore beneath the ice of West Lake Bonney in Antarctica. At El Zacatón, the sonar study showed that the sinkhole has a total depth of 335 meters: the lake is 319 meters deep at its deepest point, and its surface is 16 meters below the height of the sinkhole’s rim. How did the world’s deepest water-filled sinkhole form? – This post also considers whether or not it is continuing to get even deeper.